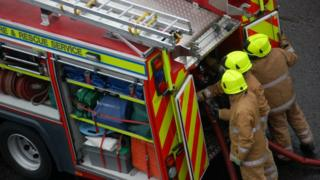 A recruitment drive to hire 300 firefighters across Scotland has been launched. The Scottish Fire and Rescue Service (SFRS) said its latest campaign will actively encourage people from a wide range of backgrounds to apply. Just 5% of Scotland's 3,000 firefighters are women and less than 1% belong to an ethnic minority. The recruitment push comes as up to half of the SFRS workforce is eligible for retirement in the next decade. The service will hold four women-only open days in Glasgow, Perth, Inverness and Falkirk next month ahead of the application process opening. Liz Barnes, SFRS director of people and organisational development, said: "We are committed to ensuring that the Scottish Fire and Rescue Service reflects our country's very unique and diverse communities - and that is why we are actively reaching out to everyone to ask them to consider a fantastic career as a fulltime firefighter. "Our message is simple - if you capable of being a firefighter, then we will help you realise that ambition."